Founding Foreigner members Mick Jones and Lou Gramm and joined Billy Joel to perform a pair of their classic hits during his January 11 show at Madison Square Garden in New York City, and video from the event is streaming online. The third single from Foreigner’s self-titled debut, “Cold As Ice” was the band’s second US Top 10 hit – following “Feels Like The First Time” – while “Urgent” was the lead track from the group’s fourth consecutive multi-platinum effort, “4". The Foreigner-Joel connection dates back many years, with Jones co-producing the piano man’s 1989 album, “Storm Front”, before he inducted the pair into the Songwriters Hall Of Fame in 2013 – an event that marked their first appearance together in almost a decade. 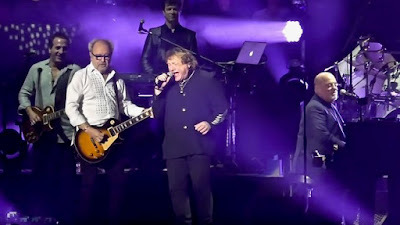 Gramm and other members of the original Foreigner lineup reunited with the current band during their 40th anniversary tour in 2017 – including the run’s US finale in Mount Pleasant, MI in October that was filmed for a forthcoming 2018 TV special, DVD and album release. Foreigner will begin a summer tour of North America with Whitesnake and Jason Bonham’s Led Zeppelin Evening in Bangor, ME on June 15.